Who can't be excited for Overkill? I'm pretty sure I won't be picking up a box (I can't see enough kitbashing potential in it right now, that's a pity) but I'm pretty bloody excited all the same! Not least of all the figures themselves-- it would appear that GW might be returning to their more classic style, which is a nice thought. Right now I just wanted to share my uncoordinated thoughts on the Space marines, what I saw when I looked at their images on the webstore so my opinion is in no way valid but oh well--! A broad overlook tells me that these will be archetypes of their chapter, in their pose, their effects, each founding chapter in a nutshell, pretty much. 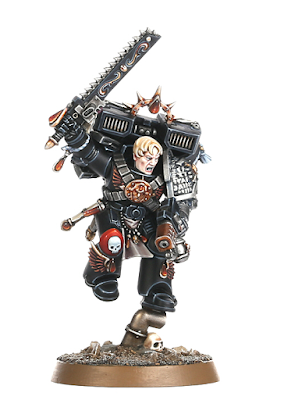 Ortan Cassius-- It's nice to see this fellow getting some attention again; seeing as he is a tyrannic war vet it only makes sense. 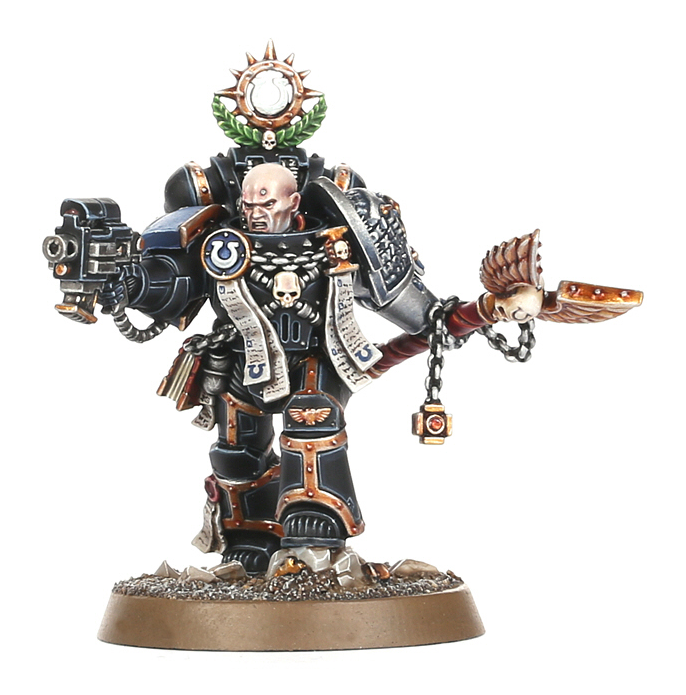 So much detail from his first metal figure has been replicated, down to the book on the chain; it's this kind of homage to the past that gets me excited... I'm not sure what happened to his face though, but his new (borrowed?) 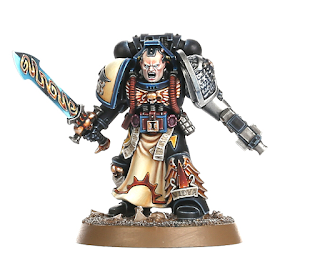 flesh certainly has a rather chaplain-ish air about it. The pose is well done, too. It feels as though he is trying to be the calm assertive energy his team can fall upon should their anger boil over-- but he's having trouble keeping calm himself. Quite understandable. 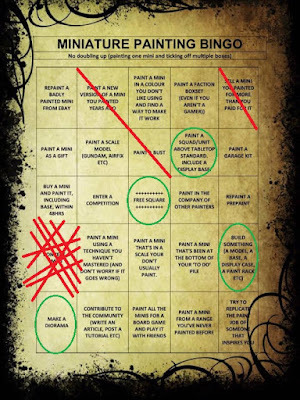 I'm saddened that they didn't keep his combi-flamer, but that hardly looks like a challenge to splice on. Not seeing the sprues, I wouldn't be too sure on the head. 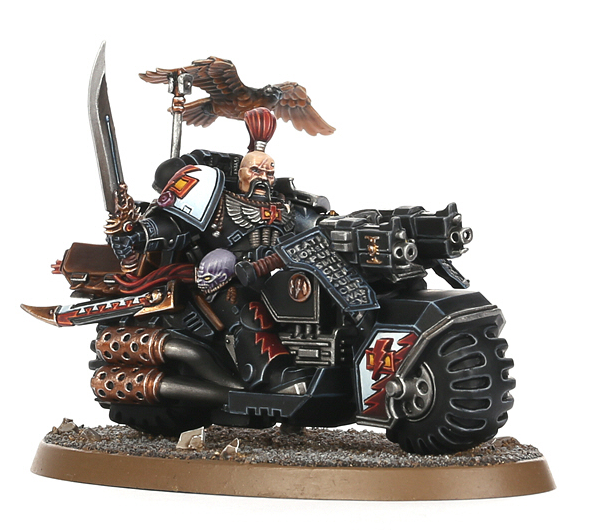 The White Scar-- Wow, they actually made a deathwatch bike. 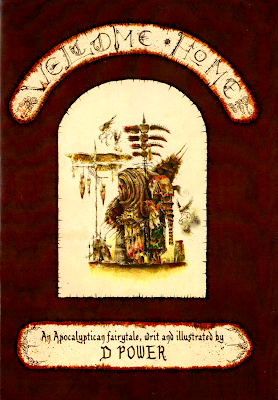 I haven't seen much of the Vth this last while, and know very little about them, so I cannot say much. But I must say I have learnt much just by looking at the figure. Feral, homeless and free, honour-bound to traditions so old their meanings are lost, proud and arrogant-- this is what he gives off, and I wouldn't be surprised if that was his Chapter's archetype. Fus Ro Dah-- I'm sorry, I actually laughed to find they had included a Blood Raven, and that they had made him a librarian. A lot of people are saying that the Blood Ravens were a missing legion, and does this inclusion prove it...? I will not deny, it is an intimidating pose; he appears to be in the middle of retorting to a challenge, maybe casting a suitably violent spell-- very, very well done indeed. It also appears to be a re-imagining of the classic and impractical but oh-so-whimsical Jes Goodwin pose. Do you see the classic lightning bolt on his thighs? I forgot that was a libarian's symbol. And I'm sorry for the Skyrim reference. A shadow dancer-- A lot of people have complained about the pose of the Kayvaan Shrike figure over the years, saying it was too balletic. I think that was the idea; their style of combat would be not unlike the eldar in grace, if not speed. Do you see those little hooks at the end of the lightning claws? Those are unique to the sons of the XIXth. Yet another addition they didn't need to do but added anyway and it looks wonderful. 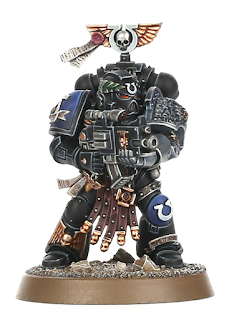 Elegant and light-footed-- the archetype of the Raven guard. You know, if I hadn't sworn allegiance to my lord the Praetorian I would have followed the shadowed lord. How adorable-- A snub-nosed terminator helmet! I felt the firedrakes were the best bit of the Tome of Fire triology, and here we have a real one! The detail too-- the heat damage across the chest, salamander pelts everywhere-- even that distinct Promethian way of depicting fire on the chest, that green edged in gold, reminds me a bit of Sigmar's comet. 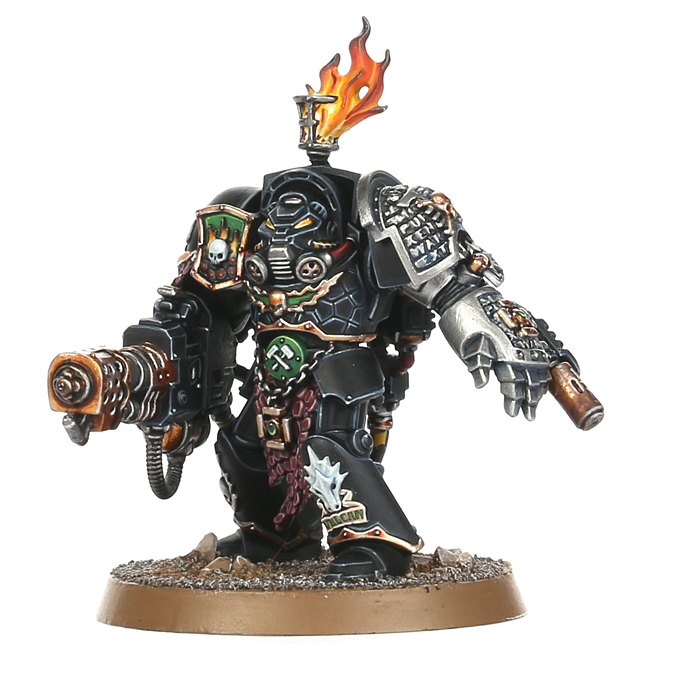 And the heavy flamer, that's another thing. It wouldn't surprise me if he hadn't made that weapon himself. I haven't got much to say about this chap, except that it's so BRILLIANT and unintentionally CUTE! Shot-cycler-- Oh, I really don't know what to think about this one... It's a VIIth Astartes, with the classic devastator boots (on Mk VI legs as well) and a helmet that closely resembles my own preferance... But that shot-cycler. Really. And that token gesture pipe. Looking at the muzzle I think it's meant to be a frag cannon, a sort of grenade launcher usually used by the sons of Sanguinius-- but that string of projectiles lead either straight out of the drum and back in, or nowhere; I find it an unusual design, not like I can talk with my own design, I just personally don't like it. Which is sad. 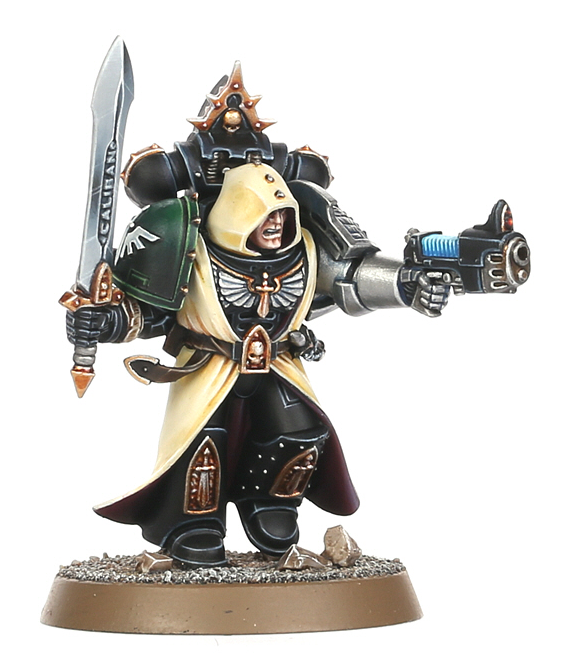 But they made the heavy weapon specialist a son of the VIIth; he really looks like he's gritting his teeth behind that mask. With foul oaths he plants his feet and with a blackening heart he swears to die before he steps back-- an archetype of the Imperial Fists. The Grimblood-- Do you remember the Space Wolf deathwatch astartes in the same team as Uriel Ventris? I can't remember his name or company, but I do know he was unbelievably badass, particularly the fact he shed his helmet so he could sniff his way through to the Norn-Queen. Maybe this is that same son of Fenris. The first thing to catch my eye on this sculpt was the knife scabbard. As a child I was most fond of toys that had swords they could put away and carry. Why did I bring that up? 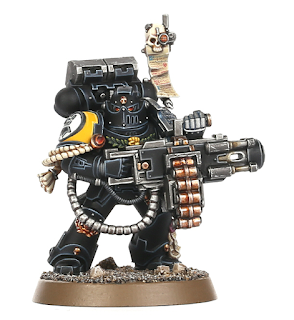 Usually, space marines mag-lock their knives thew their belts-- once again, they didn't have to add the sheath but they did anyway. Very nice. The pose too, that righteous beserkr fury with blades out and gun flung unwanted to one side-- an archetype of the Space Wolves. The Iron Hand-- I have to start on a bad note, I'm sorry. That face, the clean halved look... the first thing I saw, and it's too tidy, marring an otherwise wonderful figure. 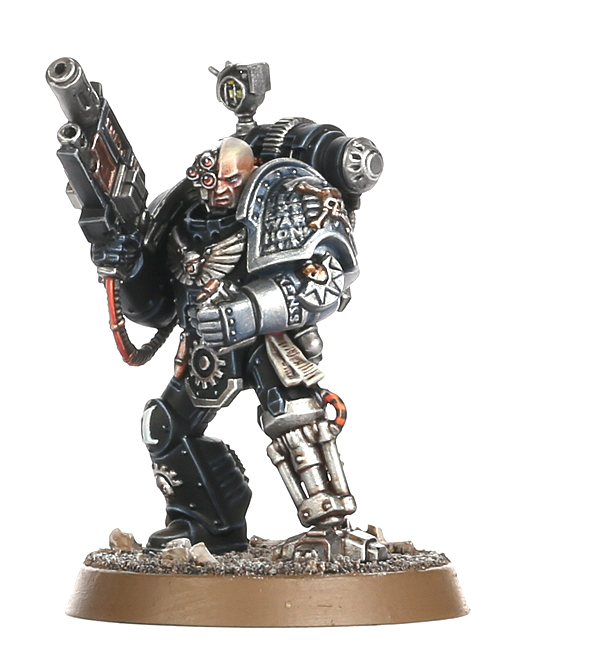 I believe this might be the first plastic suit of Mk II, of course worn by a Xth astartes, and suitably modified. 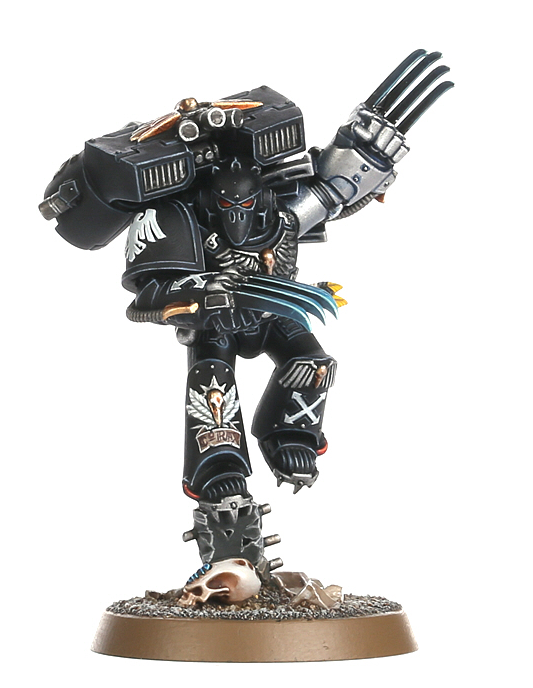 That odd leg reflects that of the old metal tyrannic war vet, yet another nice homage to the past. Reloading poses aren't usually favoured by many, from what I've seen at least, but do you not realise the image it portrays? One of calculation, one who thinks hard before acting, an air of unmoving, but calm and accepting, not as reckless or maddened as the VIIth-- a proper archetype of the Iron Hands. About as Vanilla as Overkill will allow itself-- A second Ultramarine. A Blood Raven and a second Ultramarine. In the words of Tarik Torgaddon, "... but there's so bloody many of them". I was about to question the inclusion of another XIIIth when I remembered-- but of course, the Ultramarines really, really, really, really, really, really, really, really, really, really, really, really, HATE the bugs for what they did to Macragge all those years past. Remember the box set? I was born too late, but do you see this homage? A staunch, stable (and probably rigorously drilled) pose from a classic bit of deathwatch cloth, proper display of icons and exclusive use of the hesh-pattern bolter. Where Cassius was wild and vengeful, this fellow keeps his anger behind his eyes and sees only calm death before him -- the Ultramarine archetype. The Gregorian-- it's like the Lion touched some stained-glass window within the Rock and gave it life. Once again, a completely different style to the rest of the team; the waisting of the sword, the studs and the habit, gothic arches everywhere, and of course the only plasma weapon in the squad. Next to the librarian I believe he is the most literature-heavy-- not by much, but the reliquary full of scrolls on his back is a very nice addition. It all screams "Ist legion" rather loudly, doesn't it? Overall, they're all very nice. I've been using that word rather too often now. What the hell. They're all ANGELIC. Except for that shot-cycler. And now I've rambled myself out. Perhaps I've confirmed some things in your mind about what you thought. What do you think, by-the-by? 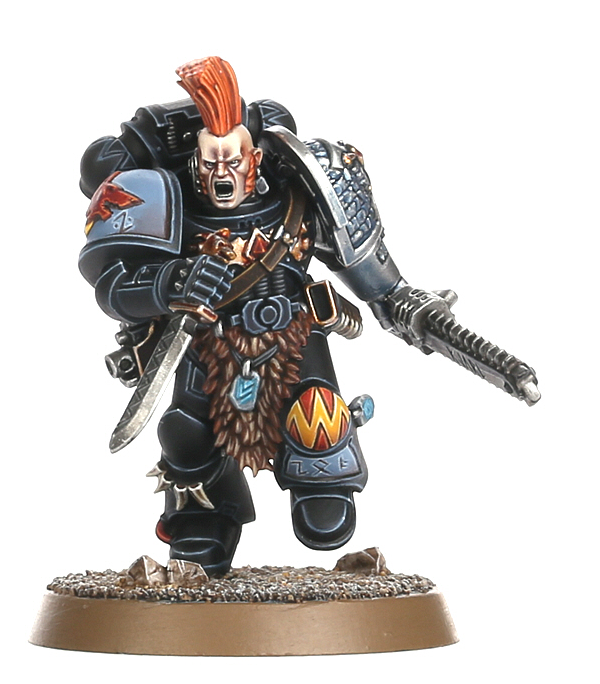 Do you like the sculpts, are there things you'd want to change should you buy Overkill? I'd be interested to hear! Firstly, I'd like to say that as of now the blog has had 11,555 views! Thank you to everyone who has taken time out of their day to look at my cruddy photos and hear my waffling all this time, it means a lot to me. 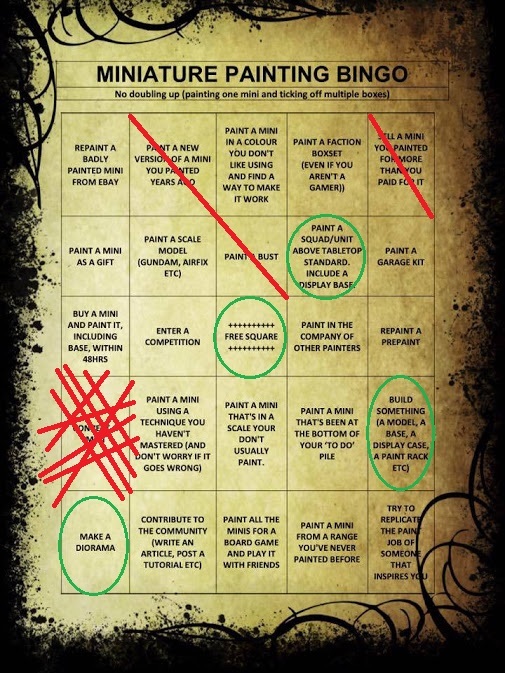 All I can really do in return is try to continue being interesting-- not that I have much to say; I'd like to write some more "rambling thoughts" concerning the style AoS has gone, though, but that'll have to wait while I struggle through my rapidly-growing project list. My WoC arrived the other day, but I won't be making any more Astartes until I get my bloody stormtalon finished-- really! How can such a thing be so hard to approach with a brush? Is it because I have become so used to painting figures? So they aren't selling the twelve packs anymore. And they have round bases, in the new size no less. At least I can base some more Angels Encarmine now. You can't tell me I didn't try. I wanted so badly to give more texture to my SM armour, so I experimented with martian ironearth and agrellian earth for something to work from. I didn't apply it thick enough but I was frightened it'd just end up looking an ebay model. Also the banner I have sorted out for this fellow is too heavy for the one magnet, so I'll be putting another in the base to steady it. I recently sold a Nurgle lord I made a while ago, so that square's nicely out of the way. 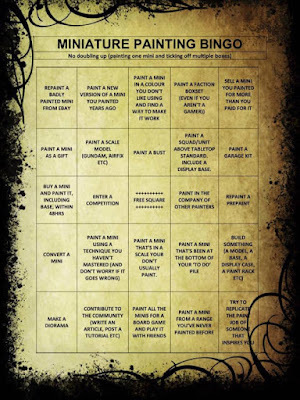 Just in case all my other projects don't count for "make a conversion" I'm making an astropath. She could also count to be "painted in a disliked colour" if not a kitbash. And here's the bust I painted; have you seen this sculpt of Legolas before? It's very small indeed, only 3" or so; I'm not sure if it was a toy from a gift shop or what, but it's a very nice sculpt and I had a great deal of fun with it. I'm also having a go at taking actual nice photographs now. Still not enough source lights (although I did go very dark under the brows). So that's that. As usual, many things happening and NO painting done AGAIN I'm sorry. Next time, I promise. First, I'll clear up that in no way did I invent this. A G+ acquaintance reshared from another, and I'm following on. For some reason I've got my incomplete Inquisitor warband in the picture too. Perhaps I'll paint them all in flash gitz yellow and genestealer purple (OUCH) and complete the "paint in a colour you don't like" square. Also a diorama. It looks quite messy right now but hopefully it'll clean up alright. So that's that. More distraction-- but such is the life of the Lonely kitbasher. It's going to be a counts-as jetbike sky hunter. I'm not exactly sure what I've begun. I was supposed to be working on the 3rd command like I said I would, but I've officially run out of WoC bodies to work from (next week will be a different story, they are in the mail as I write) and for some reason I don't feel like painting right now-- shame, shame! Also, I bought the WhFB island of blood gryphon from ebay ever-so-long ago and it's been calling to me to be used, so here we are-- though not exactly as I anticipated. I don't even know what the creature is meant to be. The closest thing I found was a Hippalectryon but that's not it... Whatever it is, I like it very much. Being a jetbike it needed a heavy bolter-- Two boltguns were considered, but there was nowhere to fit them, except around the girth. Now where to put the ammunition... I thought the rider could carry it on his back, perhaps?